The state of the Windows Store: How useful are those 100,000 apps? 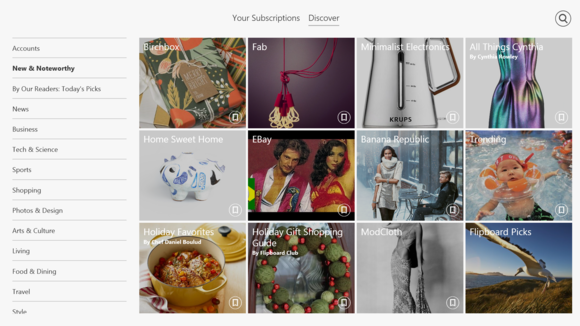 Microsoft is continuing to fill in the gaps in its Windows Store catalog with the arrival of Flipboard for Windows 8.1. Just like its iOS and Android counterparts, Flipboard's Windows 8.1 app offers digital “magazines” culled from websites large and small. After setting up an account, users can pick from a list of categories, or create magazines based on links from Facebook and Twitter friends. Users can also follow specific publications, or combine favorite articles into homemade magazines to share with other Flipboard users. Although Flipboard for Windows 8.1 doesn't stray too far from its iOS and Android versions, it does offer a few goodies for Microsoft's platform. Adding the app to the Start screen creates a Live Tile that cycles through featured stories, and the Windows Share charm works nicely for e-mailing articles or posting to social networks. Flipboard's Windows 8.1 app also has a helpful “Discover” tab for finding more magazines. Flipboard supports Snap view, allowing users to run two apps in a split-screen view, but the way it works is unusual. At minimum, Flipboard needs to occupy roughly one third of the screen, so you can't relegate it to a narrow sidebar like you can with most apps. This probably won't be an issue for most people, but it may explain why Flipboard doesn't support Windows 8. In Windows 8, snapped apps could only occupy a small sliver of the screen, while Windows 8.1 allows much more flexibility. 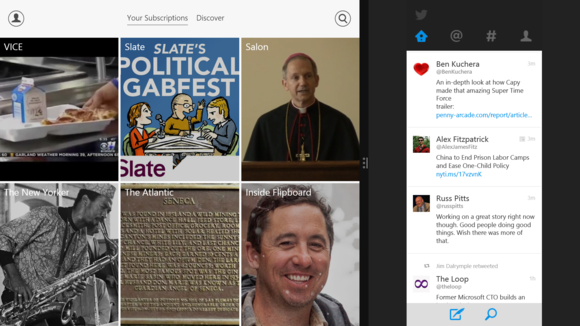 Flipboard Snapped alongside the Windows 8 Twitter app. iPad users have been enjoying Flipboard since mid-2010, and the app made its way to Android two years later. Still, the app's arrival on Windows 8.1 is one more notch in Microsoft's belt as it tries to beef up the Windows Store catalog. The storefront for touch-friendly apps has shown some signs of improvement over the last few months, with notable apps like Facebook, Foursquare and NFL Mobile. While there are still plenty of gaps in the catalog, the reading category has been sorely lacking in good options until now. Flipboard is worth firing up on a Surface or small Windows tablet.